Security at airports has become indispensable, and entails continuously increasing requirements. The only way to keep satisfy the most demanding standards day after day, is to constantly further develop the technology in use. Video surveillance is a crucial contribution to airport security; this technology has a great deal of potential, as long as the current configuration is not taken as the final goal in terms of development. “Since the technological developments and the need to increase the level of security were clearly evident, we could no longer put off considering a flexible video surveillance system, one that would be ready to meet the security and analysis requirements and guarantee a high level of performance,” says Ettore Pizzaballa, Manager of Information Systems at SACBO S.p.A. The important expansion phase at the Il Caravaggio International Airport terminal, which involved building a long gallery of shops and expanding the passenger boarding area, made the situation even more complex and challenging. This added another piece to the puzzle, alongside the usual airport security scenarios. The video analysis software allows us to better understand how the flow of passengers moves inside the terminal"
Il Caravaggio International Airport is the third-largest airport in Italy in terms of traffic, with a volume of over 11 million passengers. Security is crucial when it comes to an airport infrastructure of this size, and a great deal of attention is required to maintain the necessary level of surveillance. Introducing MOBOTIX technology (offered by the systems integrator Tecnosystem) enhanced the quality and resolution of the surveillance images. In turn, this further improved the activities carried out together with the constantly present police forces operating at the Il Caravaggio International Airport terminal, thereby providing suitable support for investigations. The parties involved aim to complete the project within two years. That may appear to be a long period of time, but it is actually rather short considering the complexity and scale of the task at hand. 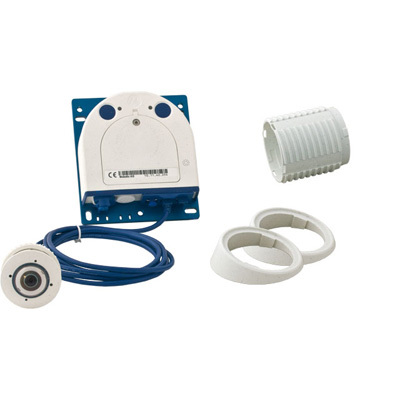 Over 300 MOBOTIX video cameras have been installed, both indoors and outdoors. Several different models were used in keeping with respective needs, including the c25, i25, M24/25, 24/25, S15, S15 SurroundMount, M15/16 and T25. Each one of these cameras is active 24/7. The new VoIP infrastructure and NAS recording allow the different control rooms to share the images. At this point, it is actually easy to spontaneously develop ideas for the future, expanding the field of application of a system that boasts continuously developing potential, and utilising the video surveillance infrastructure and its video analysis applications in order to obtain immediate and concrete results. The benefits are numerous: “The video analysis software allows us to immediately detect abandoned objects, locate the optimum route for vehicles in the manoeuvring area and better understand how the flow of passengers moves inside the terminal (which we need to plan optimal routes), studying which type of traveller goes directly to the gate and which one stops instead to make purchases at the shops. The software also allows us to constantly monitor the lines at security checks and check-in and boarding areas in real time,” summarises Pizzaballa.